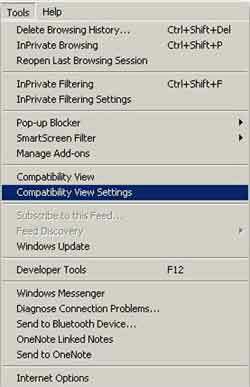 Each new option in IE8 is a change to the Internet Explorer Software family since the release of IE7. New options such as Accelerators, InPrivate Browsing and Web Slices are discussed in Part 1. This page is Part 2, introducing the SmartScreen, Compatibility View button and the Smart Address Bar search improvements. After reading through this article are in position to take a closer look at how to update some of the common options to suit your own needs. Part 3 is found on the Internet Explorer Updates page. Parts 4 and 5 look in detail about what to do if Internet Explorer runs slowly. As with most Microsoft Software, there are lots of ways to do the same thing. Have a look through the Internet Explorer Slow and Internet Explorer Running Slow pages for my take on things. 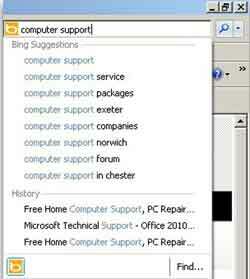 Part 6 shows you how to Reinstall Internet Explorer. Sometimes all the fancy fixes just won't work. Time for a reinstall! If you are using Windows 7 or later, and wish to continue using Internet Explorer, upgrade to the latest version (Opens New Window). This ensures you have access to all the latest features for today's web surfing, and have all the security measures that Microsoft have implemented to date for safer browsing! Listed below is a link to each feature discussed. This gives you the option to either read through the whole page, or hop to the feature of interest. 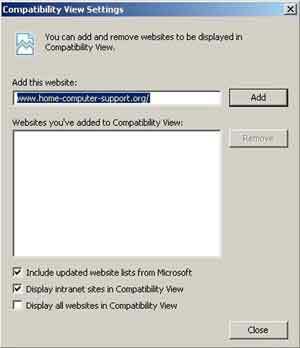 Step 5 gives you the opportunity to share with everyone how you make use of the features that come with IE. This is your opportunity to write your own page. Step 6 enables you to jump directly to the contributions from other visitors to this page. Take a look. You may find out something new! How Do You Use Internet Explorer Features? 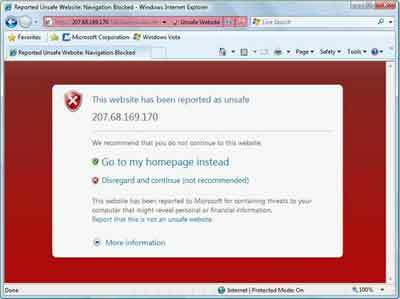 SmartScreen automatically blocks access to sites that are reported to Microsoft as unsafe. It is turned on by default, so you are protected from the start of your browsing session. If you find yourself trying to access a reported site, the following message appears. Do Not Disregard And Continue! You are opening yourself up to attack. There are some dodgy people out there who use very cleaver ways to attack your computer and steal your money. An example of what is known as a social engineering attack is phishing (pronounced 'fishing'). Have you ever received an e-mail from your bank asking you to click a link to confirm your details such as your user name and password? As genuine as the e-mail looks, this is a phishing attack! The link sends you to a genuine looking banking site. If you enter your user name and password, you are giving the cyber criminals access to your bank account. They will clear you out! SmartScreen blocks the dodgy site with the warning in the image above. It acts like an anti-phishing filter. It also protects you from Malware and other types of nasty stuff that can steal your information. This nasty stuff is also blocked within honest sites, further protecting your web experience. 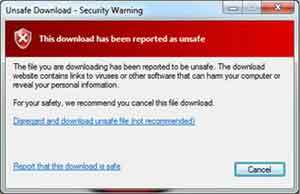 Suspect files you attempt to download are be flagged by SmartScreen. If your come across a suspect site, report it to Microsoft. They say about 50% of their suspect site list is reported by users like you. Do your bit! Tip: Struggling to see some parts of a web site? 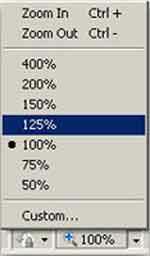 Zoom in by clicking View > Zoom, then select one of the percentage figures higher than 100. The same menu can also be accessed by clicking the 100% button in the bottom right hand corner of your browser. Microsoft's radical changes mean some sites created for Internet Explorer 7 will not work (or render) properly in Internet Explorer 8. This means some sites may not look right. Images, text and web site menus may not appear in the right places. If you visit certain sites regularly and you know they only look right in compatibility mode, you can setup Internet Explorer 8 to automatically load the web pages up in compatibility mode. If you are already on the site in question, the 'Address of web site to add to compatibility view' field already has the web address in it. Otherwise left click in this box and type the web address into it. Tip: If you are looking for a certain word or phrase on a web page that has a lot of words on it, hold the Control Key (Ctrl) down on your keyboard, and while it is pressed down, press the F key. Then enter the search text of your choice and either press the Next Button on the find bar, or hit the return key on your keyboard. The address bar shows the web site address you are visiting (The http(s):// bit). 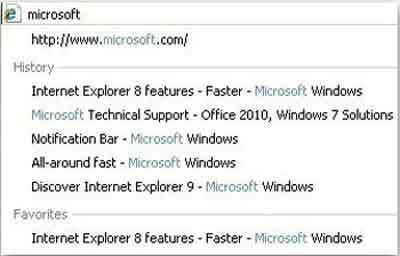 In IE8, if you type in a web site address in the search bar, it automatically show you sites you have already visited, the searches you have already done, and your favourites. The sites, searches and favourites that appear depend on what you are entering into the address bar. This is useful when you can't quite remember the exact web address of a site you visited earlier. You can also delete any of the suggestions listed by highlighting and left clicking the Red X that appears. Tip: When you use the Search Bar in the top right hand corner of the browser, the suggestions feature 'suggests' search words and phrases to you in a drop down box. This is handy when you can't quite think of the word or phrase you want to search (happens to me all the time!). Internet Explorer 8 also comes with Automatic Crash Recovery (ACR). This means if the web browser crashes for some reason, it attempts to recover all your open tabs when it restarts - a long awaited Internet Explorer fix. IE8 includes a lot of new features to make your life easier. Additional feature information is found on the Microsoft Accessibility Tutorials (Opens New Window) page. Lots of new Internet Explorer Software features comes with lots more things to setup properly. The next part of the tutorial series takes a closer look at how to setup some of the more popular features of the web browser. How Do You Use IE8 Features? Do you use features like Compatibility View and Smart Address Bar? Enter Your Title e.g. "Search Suggestions - New Ideas"